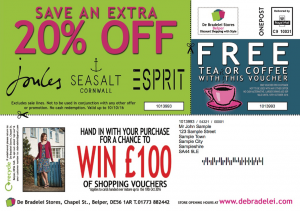 PODi published a Case Study about De Bradelei Stores, a group of shopping outlet malls in the UK, who wanted to increase footfall and boost sales in Autumn 2016 by targeting lapsed customers from their extensive database. 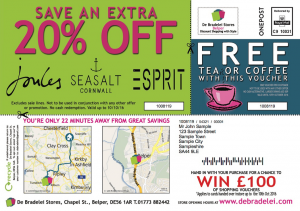 Eight Days a Week Print Solutions proposed a geomarketing Direct Mail campaign using locr personalized maps to show recipients the proximity of their nearest store and the route to drive there. A controlled A/B test with and without the geomarketing components tested the effectiveness of using geomarketing as an overall strategy for retail traffic generation and served as a basis for De Bradelei’s future marketing programs. … The rest received a design with a static fashion image. Get all the campaign details in this independant PODi Case Study. If you’re marketing to the retail industry you might want to find out how to drive more traffic with Geo-Personalization.